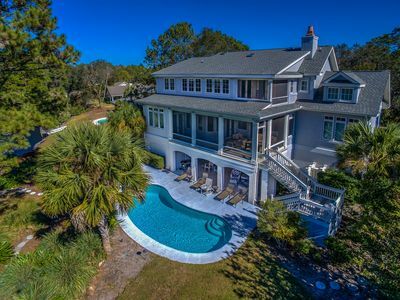 6 Rum Row ~ Beautiful 6Br Home with Lagoon Views in Palmetto Dunes! 6 Rum Row ~ Fish right from your Private Dock! 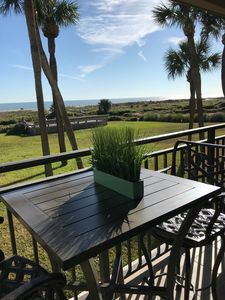 6 Rum Row is a gorgeous couples or family-oriented home with expansive sun set views of the 11-mile lagoon system that runs through Palmetto Dunes. Easy access for kayaks, canoes or fishing. 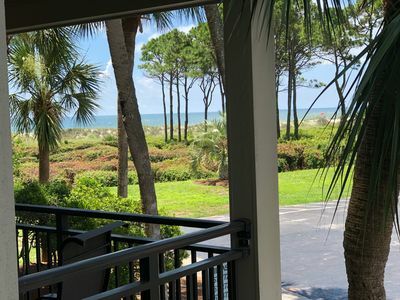 This magnificent 6 bedroom, 5 bathroom vacation rental in Palmetto Dunes has a grand entrance with a large circular driveway, which allows for plenty of parking, lush tropical landscaping and a double-sided wrought iron staircase leading you into this majestic luxury home. 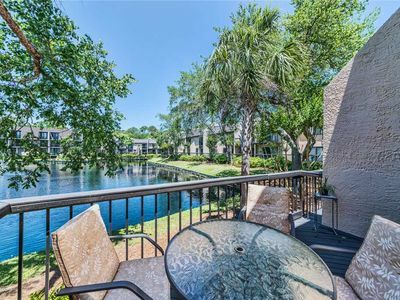 Upon entering the foyer, the first thing you will notice is a gorgeous, expansive view of the 11-mile lagoon system, keeping this home bright and cheerful! You will find gorgeous oak wood flooring, a coffered ceiling and an open floor plan throughout the downstairs main living area. The formal dining room is to the left of the front door and has seating for 6. The kitchen is perfect for preparing meals for a large group; there is plenty of room, a large pantry and tons of cabinet space. You will find dark cherry wood cabinetry, all stainless steel appliances, including a flat top stove, two ovens and an under-the-counter wine refrigerator. There are four bar stools at the granite kitchen counter top along with a breakfast table that seats six with awesome views of the lagoon. The kitchen is open to the living room which has a beautiful mantle, built-in bookshelves, a sectional sofa and a large flat screen television. 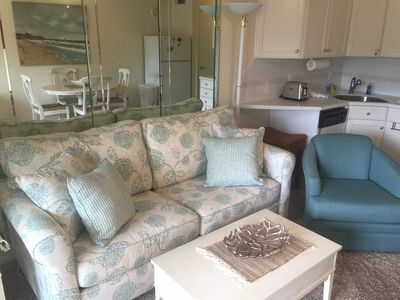 The large screened in porch is the perfect place to enjoy your morning coffee, watching the pelicans dive in the lagoon for their breakfast, or enjoying an afternoon beverage as you watch the evening sun set. 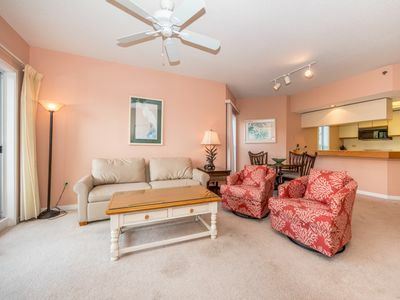 The porch has two ceiling fans, comfortable wicker furniture and a door that leads downstairs to the swimming pool. Just off the kitchen is the master bedroom, with a king size bed, flat screen TV and private access to the screened in porch. 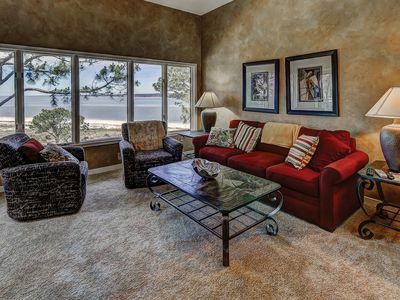 Beautiful views are to be had from this room of the lagoon and back yard. The large master bathroom is a very classic pale gray color, with a double sinks, a large Jacuzzi tub, with custom tile work, spacious walk-in shower and a large walk in closet. You can also access the laundry room from here, as well as a separate room that could be used for an exercise space, a playpen or crib, this room also has a flat screen TV on the wall. At the left of the entry, you will come across the door accessing the elevator, a door that leads you to the three car under-house garage and a guest bathroom that has a tiled walk-in shower and a copper sink that sits on a granite counter top. At the end of this hall is the guest bedroom with a queen sized bed and stunning views to the water. On the first landing of the stairs there is a bedroom that has two twin beds. As you travel up two more stairs you will come to the access for the elevator, and one of three bedrooms on this floor. This first bedroom has its own private bathroom with a skylight and a shower/tub combination. There is a queen sized, four poster, wrought iron bed, a wall of bookcases (with plenty of reading material) and access to a second floor balcony that has unbelievable views to the pool and waterway below. You will then come across a set of French doors that lead to the upstairs Great Room, complete with a couch and love seat, television set and a wet bar with a mini-fridge and beautiful lighting fixtures. This gathering room also has access to the second floor balcony. Further down the hall on you right will be the second of the three bedrooms on this floor. 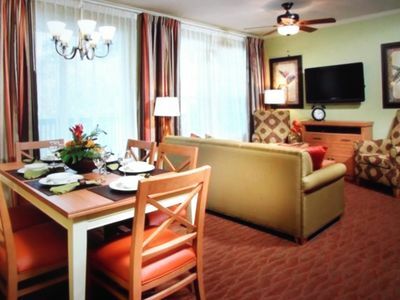 This room faces the front of the home, has a wonderful reading nook with windows, flat screened TV and a king sized bed. It has its very own private bathroom with a shower/tub combination and granite counter top. There is also another smaller room attached, this could be used for a children’s play area, or a crib. At the very end of the hallway is the 3rd upstairs bedroom this has a queen sized bed, TV and a very spacious private bathroom, with a walk-in shower and fantastic views. 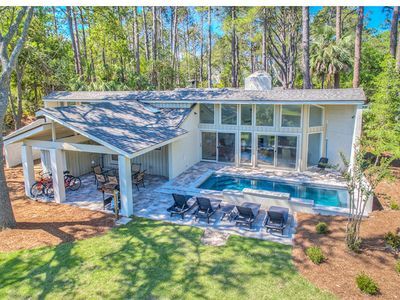 By far one of the main highlights of this home is the pool and backyard, which is situated on the 11 mile waterway system that runs though out Palmetto Dunes. From almost every room in the house you will have views of the water and lush landscaping, a multitude of birds and jaw dropping sunsets. You will see many kayaks; canoes and battery run boats cruising through these waters. There is a pathway that leads to your own dock where you can do some fishing or just sit and take in the view. 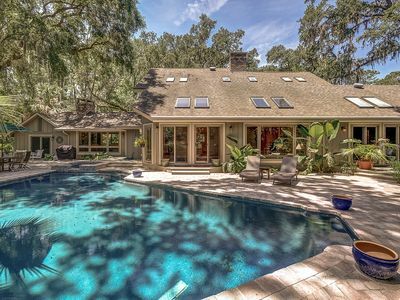 The backyard itself is very private and features a large, teardrop swimming pool, an outdoor shower and an enormous covered grilling area with six teak rocking chairs for relaxing. 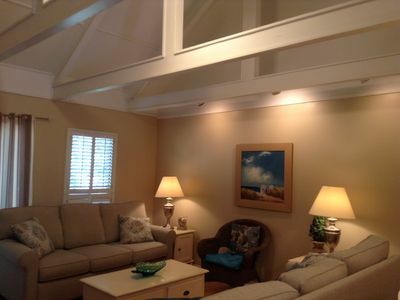 This home is perfect for multiple families, golf couples or a family reunion. 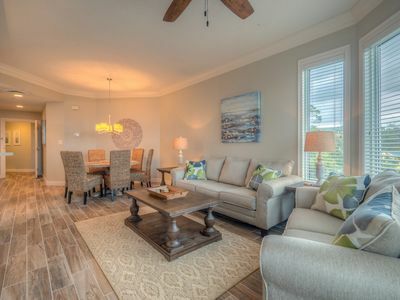 6 Rum Row has convenient access to the beach through a short walk or bicycle ride. *Additional charge to heat the pool. 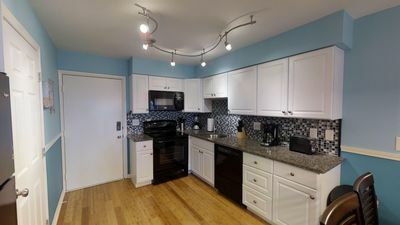 3 Bedroom 3 Bath Condo Veteran's Day Week! 2311 Sea Crest-Beautiful 2BR/2BA! Sleeps 8! 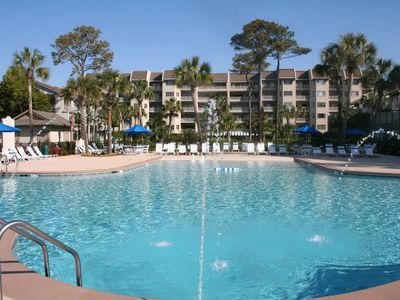 Complex pools and fitness center! 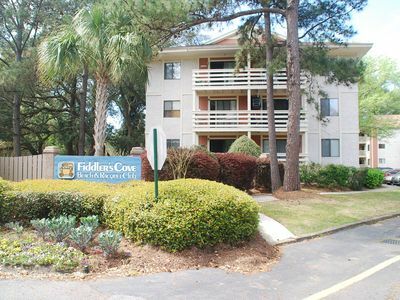 Summer Rates FULLY RENOVATED FIDDLERS COVE 2 BEDROOM, 2 BATH - WiFi CABLE, CLOSE TO POOL & BEACH! Closest Queens Grant Villa To The Beach.